At this time, Lermontov was just in exile. He created a vivid self-portrait. We see a man dressed in a regiment of dragoons. Characteristic red collar, spectacular epaulettes, burka and invariable checkers. Lermontov portrayed himself knee-deep. Burka is thrown over one of his shoulders. Right behind it is the virgin nature of the Caucasus. It is practically not spelled out. One can only guess the outlines of majestic mountains and a grand sky. The combination of gray and pink tones is really impressive. The poet wanted to give this self-portrait to the woman he loved. Her name was V. A. Lopukhin. He gave her his creation in 1838. 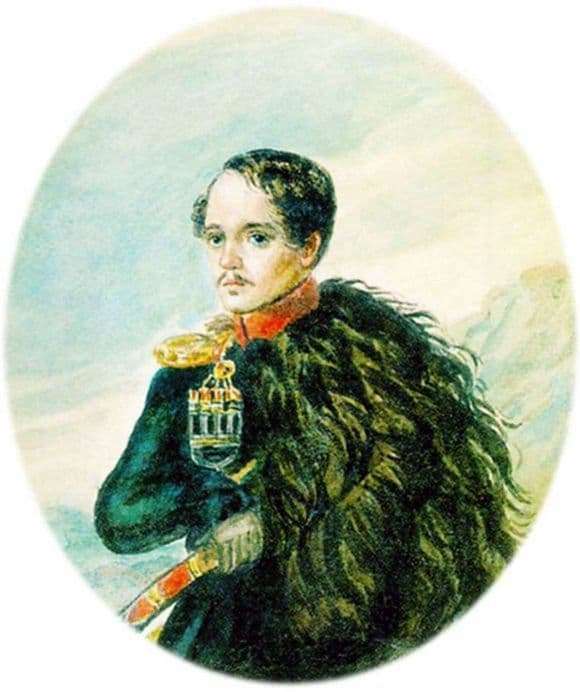 Lermontov portrayed himself very similar. But contemporaries were surprised by the hairstyle. They were sure that the poet did not wear hair like that. But it is quite possible that in the Caucasus the poet could afford such liberties. The colors of this watercolor are impressive. They are as natural as possible. Lermontov skillfully uses shades, creating truly tangible features. He paid maximum attention to the image of his face. Before us is a young man who is already wise with a great life experience. His head is slightly turned. Facial features are correct. In the eyes you can read the hidden sadness and secret thoughts that do not leave the poet. He looks off into the distance. What is he thinking about? Hard to guess. Maybe he strives to contemplate his own experiences. His thoughts are focused on the past, and his eyes are directed to the future. Lermontov was able to create a truly vivid portrait. He imprinted himself as he imagined himself. He was able to express hidden thoughts, unspeakable sadness and tragedy. The poet was able to convey the softness of his soul and incredible kindness. Before us is a living person with his experiences, aspirations, dreams and desires. It is this, most likely, that we represent the poet, reading his poems.